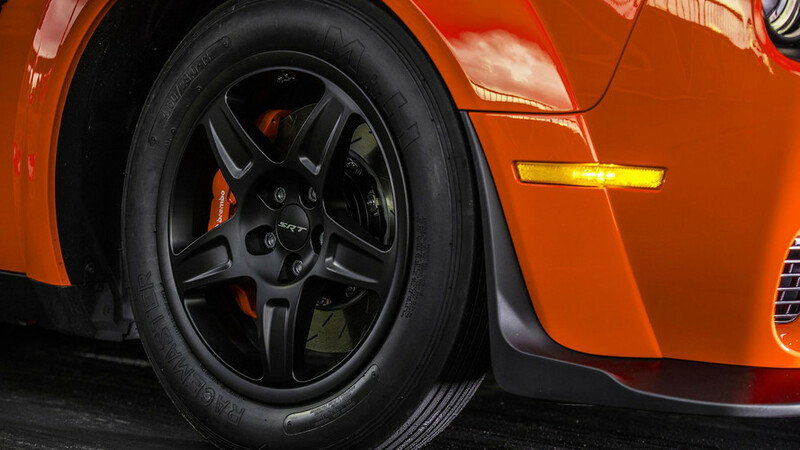 The 840-hp Easy Button to activate your inner drag racer. 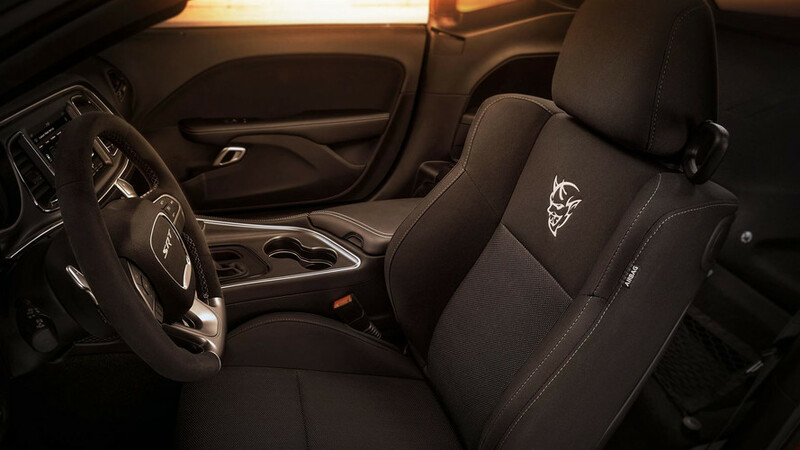 Let’s be honest: All you really want to know about the Dodge Demon is what it feels like to launch it down a drag strip. To find out, I’m driving a Go Mango-painted one that’s filled with high-octane fuel to unlock all 840 horsepower and 770 pound-feet of torque available from its engine. 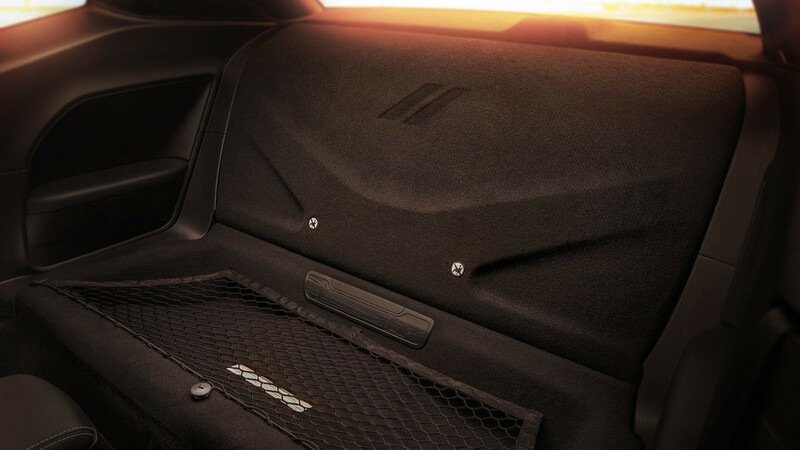 It wears skinny front-runner tires, and has the optional harness bar and harnesses fitted in place of the Challenger’s normal back seat. The only way this Demon could be better primed for going fast is if it were built without a passenger seat; models that do not include that option are another 58 pounds lighter. 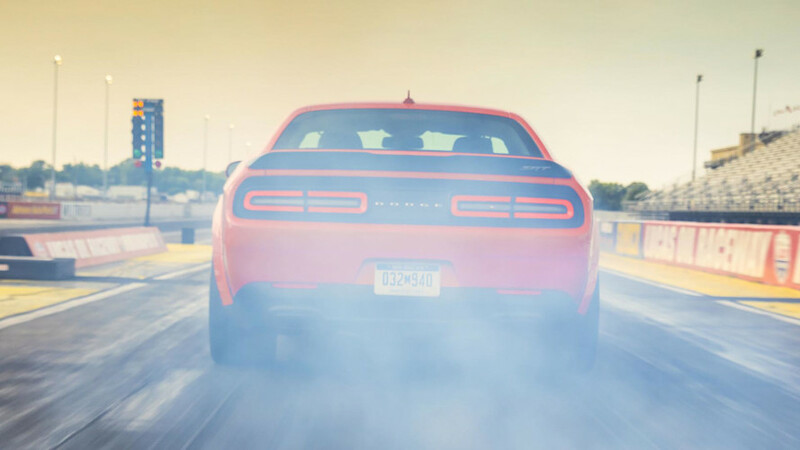 Do it perfectly, and Dodge says the Demon will accelerate at 1.8 g – quicker than if you dropped it off a cliff – and run a quarter mile in 9.65 seconds at 140 miles per hour. That’s record-setting stuff. Even with me at the helm, the Demon hooks up and explodes out of the gate. The nose rises as the rear tires hunker into the road surface, and the sprint to 30 mph is over before I can blink. Supercharger whine deafens as the car tears down the track, with upshifts that snap my head back each time. It pulls and pulls and pulls, and feels like it would keep going long, long after crossing the finish line. The timing lights are turned off for our test drives at Lucas Oil Raceway to stop anyone getting over-eager behind the wheel, but there’s no doubt in my mind that I’ve never driven myself through a quarter-mile as quickly as I have in the Demon. It is a brutally fast machine. Getting the Demon off the line is not, however, simply a case of selecting Drive and flooring the throttle; it requires a mix of both manual footwork and electronic trickery. To start, I creep the burbling car up into the burnout box, tap “Activate Line Lock” on the touchscreen, stand on the brake pedal, then press and hold the “OK” button the steering wheel button to keep the front wheels stationary. Then I apply lots of throttle, cackle with laughter at the plume of smoke in the mirrors, and then release “OK’ and roll forward. For our runs, Dodge techs lowered the rear tire pressure to 20 psi, the idea being that they’d warm to 23 psi after hitting the burnout box. And on drag-radial tires like the Demon’s Nittos, burnouts are for more than just show. “We want to get it [the tire] up to proper operating temperature, and we want to get all the stones and debris off it,” explains Jim Wilder, Challenger SRT vehicle development manager. 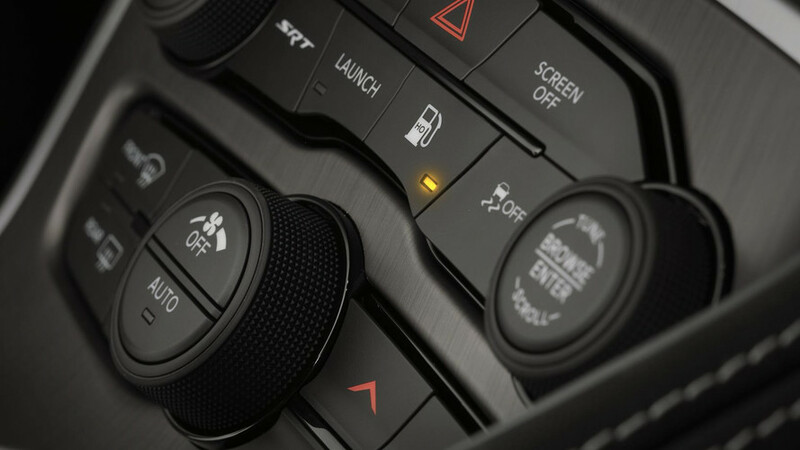 With the Demon in Drag Mode – tap the “SRT” dash button twice to activate it – the suspension is primed for an aggressive nose-lifting launch, the air conditioning is redirected to chill the engine inlet air, and I can use the TransBrake (it’s the first-ever factory car with one) by simply pulling the two paddle shifters. I hold them both and brake-torque the engine to preload the driveline – “If we didn’t do that, the impacts [on launch] would be horrendous,” says Wilder. I can use the TransBrake by simply pulling the two paddle shifters. I hold them both and brake-torque the engine to preload the driveline – “If we didn’t do that, the impacts [on launch] would be horrendous,” says Wilder. Then I take my left foot off the brake pedal and give it some throttle, holding the car in place only by keeping one shift paddle held. Raise the engine revs to about 1,300 rpm, release the paddle, and hold hold on tight. Quickly move to full throttle, and there’s almost no wheel spin or hesitation before the car charges away down the track in a cacophony of fury. Though it must, of course, be treated with respect, the Demon isn’t as terrifying as I expected; it pretty much just sticks and goes. 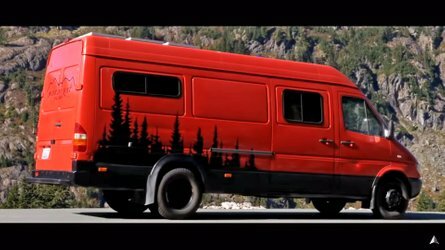 There’s tremendous grip from the tires, the adaptive suspension helps soften the nose-lifting launch events, and even in Drag Mode the stability control is still active to help catch you if you were to get squirrely. As super-quick cars go, it’s the closest thing to an Easy Button around. 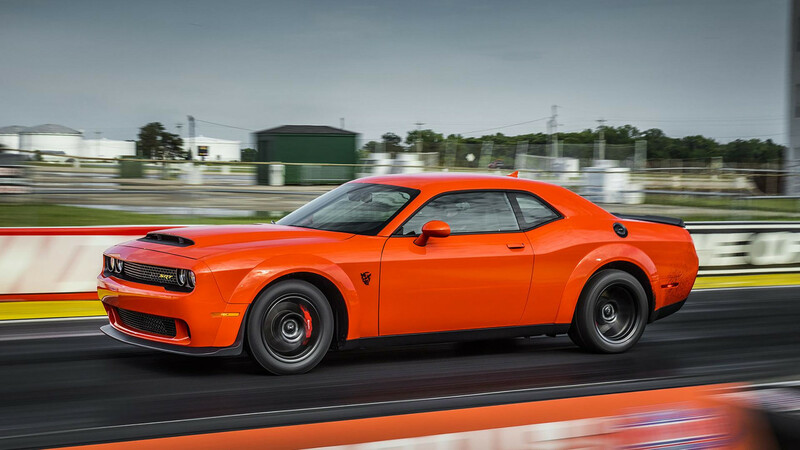 The Demon is also essentially a rolling billboard for the entire Dodge brand; excitement for this 3,300-unit special can bolster sales of other cars. By now, Dodge has also tattooed our subconscious with every detail about the engineering trickery that makes the Demon so fast. 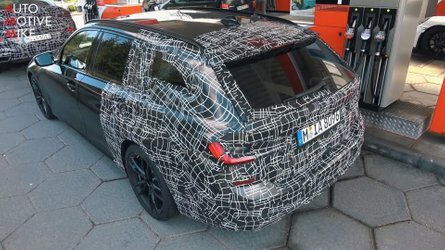 Its 6.2-liter supercharged V8 makes a healthy 808 hp and 717 lb-ft of torque on regular 91-octane gas, but if you buy the optional $1 Demon Crate and install a new engine-management computer and fill up with 100-plus-octane fuel, ignition timing increases by 5 to 8 degrees to extract 840 hp at 6,300 rpm and 770 lb-ft at 4,500 rpm. 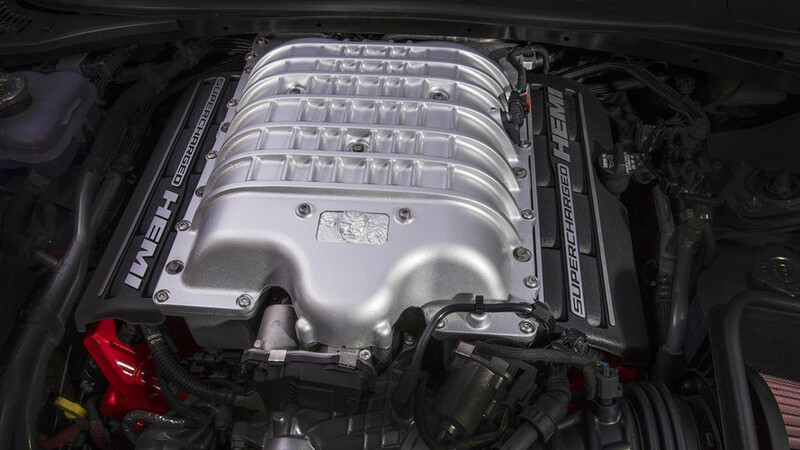 The engine’s redline is 6,500 rpm to accommodate the higher horsepower peak, versus 6,300 rpm in the Hellcat. Finally, a dramatically redesigned air intake tract has 35-percent less restriction than the one in a regular Hellcat. Because heat is the enemy of horsepower and, more importantly for drag racers, consistency, much effort was put into keeping the engine cool. 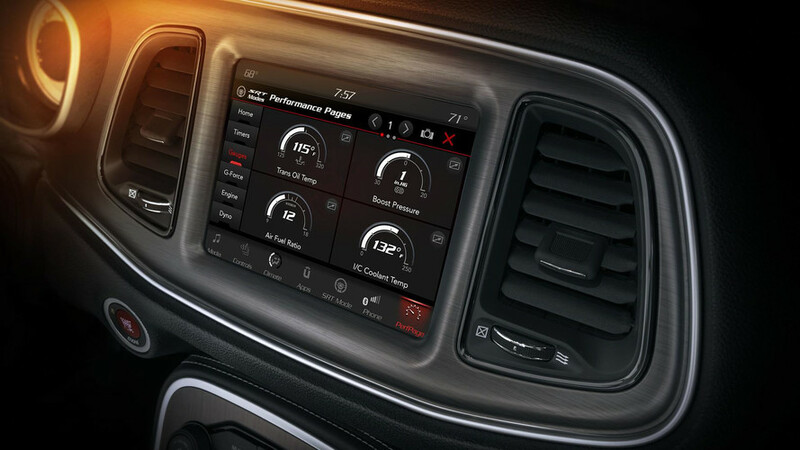 The packaging of the cooling system was completely redeveloped compared to the Hellcat, and in Drag Mode, the Air-Chiller feature uses the air conditioner to further cool inlet air. A special after-run system can keep the coolant pumps and fans running to bring temperatures back down to normal after a hard run. “That basically avoids all of the heat-soak problems that would normally be associated with your second or third or fourth run down the drag strip,” says Chris Cowland, Director of Advanced and SRT Engineering for FCA North America. 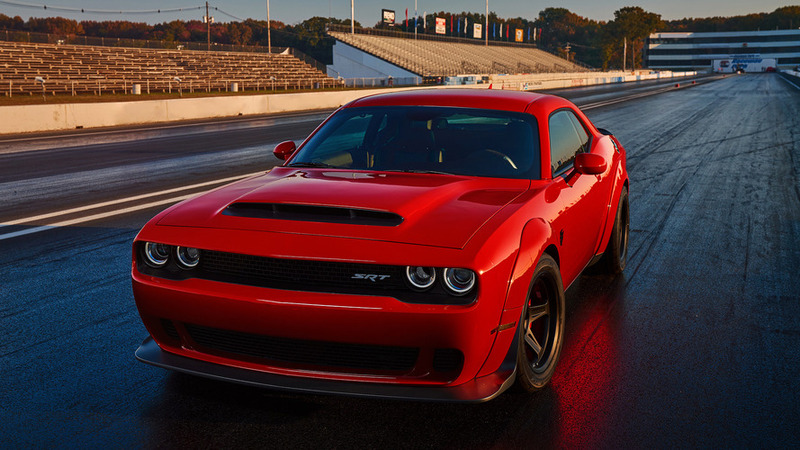 Compared to a Hellcat, the Demon is also as much as 215 pounds lighter, thanks to the removal of things like the back seat and 16 speakers, as well as the fitment of smaller, lighter brakes; lighter wheels; and hollow anti-roll bars. Those lighter wheels measure 18 inches in diameter and 11 inches wide, and wear street-legal drag radial tires from Nitto. Dodge engineers assure me they’re totally fine to use in the rain, but I doubt many owners will put that to the test. In addition to special modes for the adaptive suspension, the Demon’s chassis gets slightly less rear camber for improved straight-line grip. 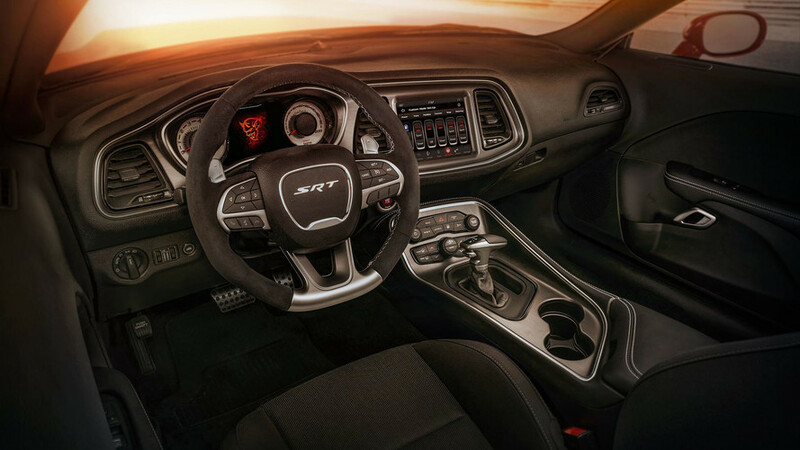 It has electric power steering rather than the Hellcat’s hydraulic arrangement, the better to cope with the added mass and grip of the new tire package. 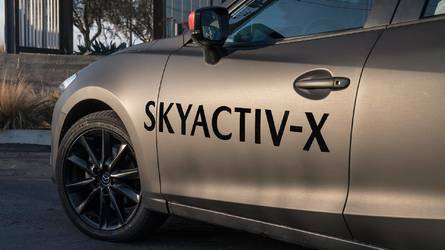 Many of the new parts provide what may seem like only marginal gains in acceleration, but it all adds up in the long run to get the car away from the start as briskly as possible. The new high-stall torque converter, for instance, can save about a tenth of a second off a run. Likewise, Demon driveline engineer Joe Johnson says that using the TransBrake cuts up to an additional tenth off a quarter-mile run. There are two reasons it shaves time: First, you can build more revs before launching to take advantage of the torque converter than by brake-torquing alone. Second, the TransBrake also puts the engine in “Torque Reserve” mode, which uses cylinder-deactivation tech to run the V8 on four or six cylinders, while closing the supercharger bypass valve. The result: The engine builds about 8 psi of boost (the maximum amount under load is 14.5 psi), compared to only 3 psi if you torque-braked the engine the normal way, allowing for launching the car with up to 534 lb-ft of torque ready immediately. 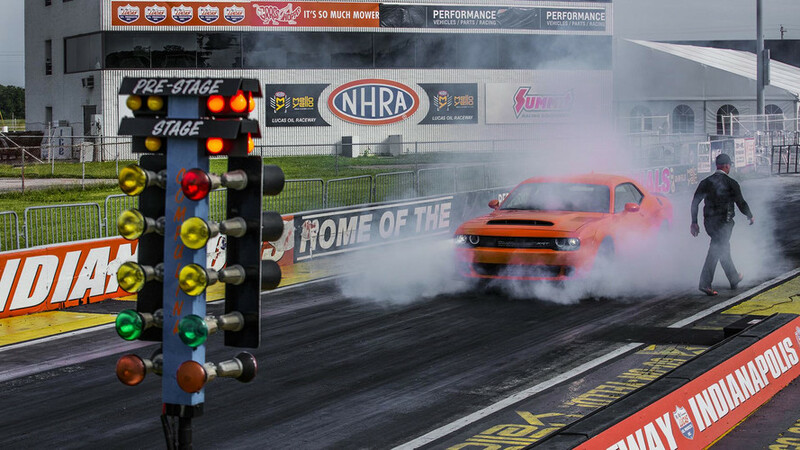 “We looked back at the established drag-racer tricks and said, ‘Which one of these can we use?’’” says Johnson. 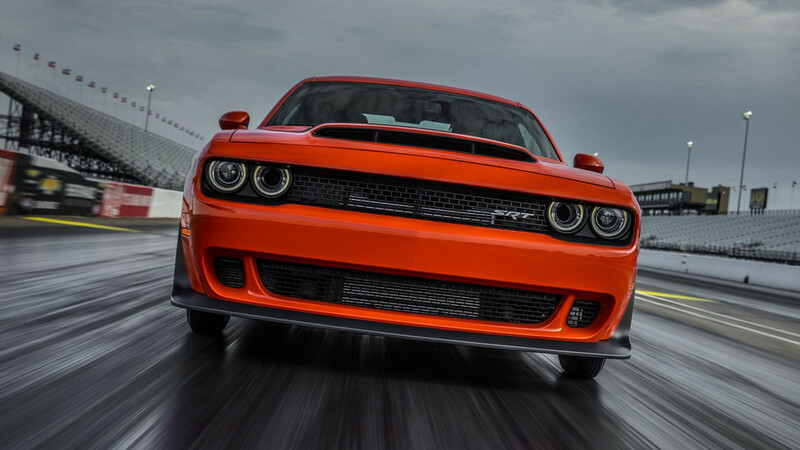 Of course, Dodge still had to put the Demon through all of its normal test procedures so it could be sold at dealerships, registered at your local DMV, and covered by a warranty. If you are lucky enough to buy one, though, please make sure you take it to the track at least once. 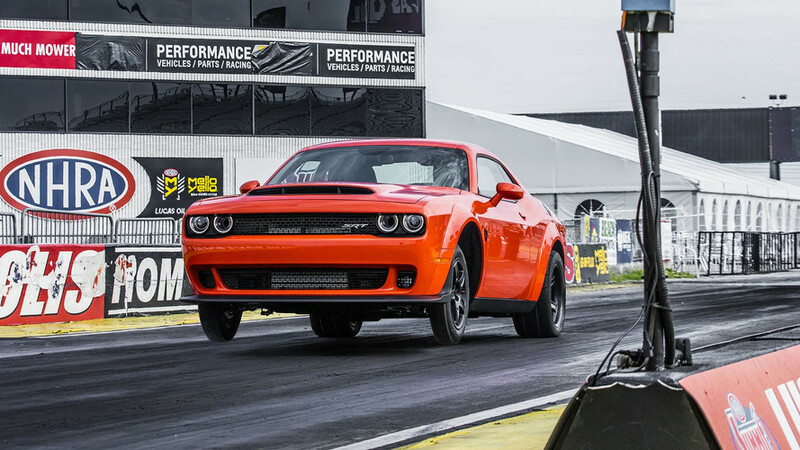 The Dodge Demon’s brilliance is the brutal effectiveness with which it converts gasoline into straight-line speed. In fact, he says that one particular Demon development car survived more than 1,100 real-world quarter-mile passes on its original engine, and more than 500 on its original differential. That should help calm the nerves of anyone who wants to use the car as intended at their local track. After half a dozen drag-strip runs, I’m able to briefly slip out to drive a Demon on regular public roads. 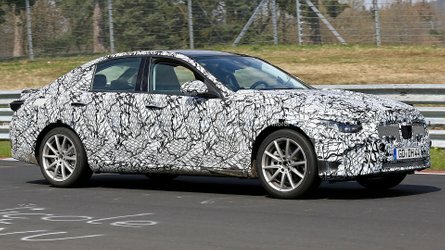 The overwhelming impression is one of comfort: with lower spring rates than a Hellcat (35-percent softer in front, 28-percent softer in back), plus the far bigger sidewalls of the 315/40R18 tires compared to a Hellcat’s 275/40ZR20 rubber, the Demon is positively plush over broken concrete when everything is switched back to the Street driving mode. 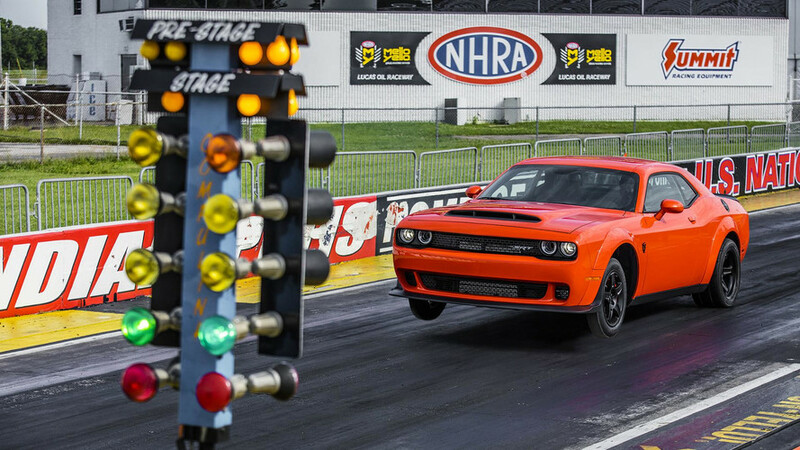 This drag-racing special doesn’t punish and brutalize passengers’ spines. Otherwise, it mostly drives like any other Hellcat in traffic. 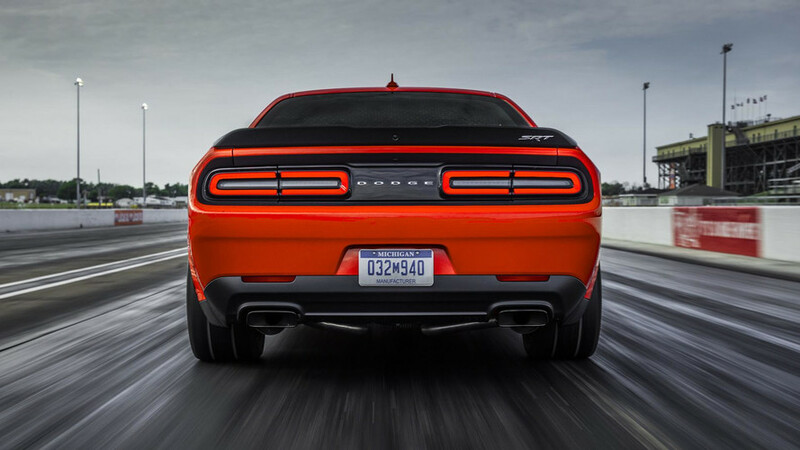 Supercharger whine and exhaust roar dominate the experience, and you can pretty much break the rear tires loose on command – though not quite so easily as in a regular Hellcat thanks to the wider rubber. 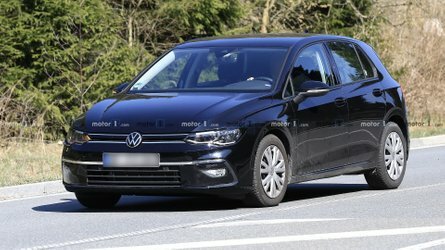 The electric power steering is reasonably light, too. If you wanted to daily-drive your Demon, well, it wouldn’t be a problem. If you are lucky enough to buy one, though, please make sure you take it to the track at least once. 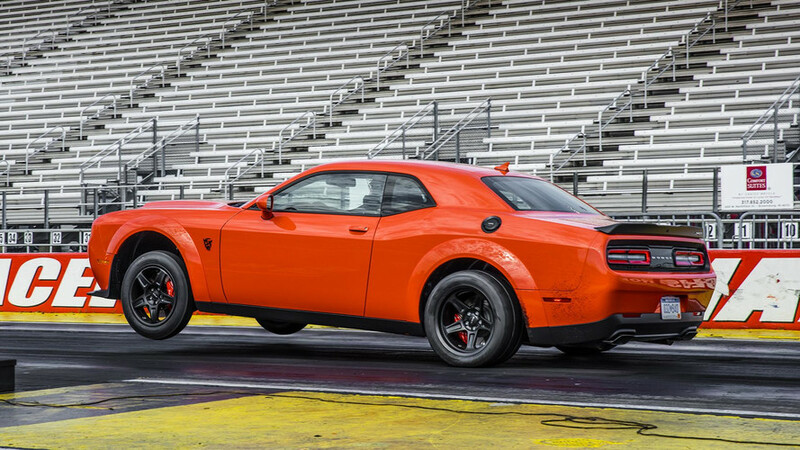 The Dodge Demon’s brilliance is the brutal effectiveness with which it converts gasoline into straight-line speed. That doesn’t mean you’ll instantly be able to replicate that 9.65-second pass – as you’ll see in the video above, it took me several tries to really nail the launching process. But it does mean you’ll be at the helm of an incredible thrill ride that leaps down a track in a way no other factory-fresh vehicle can do. 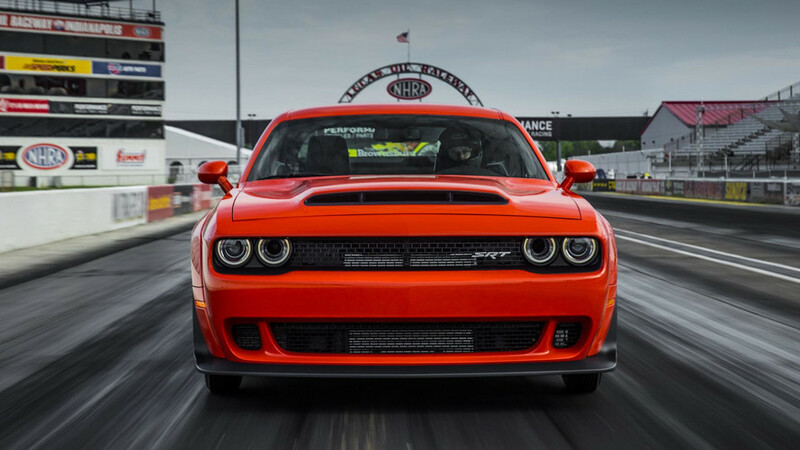 Dodge engineers made enormous promises and boasts with the Demon. And you know what? They delivered on all of them.